Winemaker’s Notes: A great dark garnet-red. The first nose is quite closed with a dominant of graphitic, leather, and then intense aromas of pepper, black fruits and scrubs. The attack is rich, dense. Then the wine is fleshy and solar. The final is sappy served by delicate tannins and a great freshness. 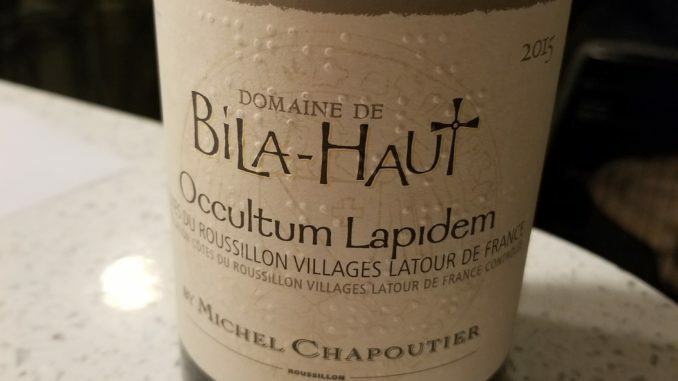 My Review: I’ve had Bila-Haut wines in the past and have generally enjoyed them, but I have to say, that the 2015 Occultum Lapidem Red, is maybe my favorite wine of the last few months, and that’s no small praise (I’ve had some good wine of late). In the glass the wine was a medium-dark red, and on the nose I picked up dry notes of herbs and tart, dried black cherries. In the mouth the wine was dry, with flavors of dried herbs and tart cherry that gave way to a dark chocolate finish. Amazingly, at 15.5% alcohol/volume, there wasn’t a hint of hotness on either the nose or in the mouth, even with minimal time for the wine to breathe. My wife and I paired the wine with tortellini and sausage in an arrabiata sauce, and it was a good choice – the dryness of the wine begged for saucy pastas or a juicy meat, so a nice juicy ribeye off the grill wouldn’t be out of place here either. I really can’t stress how much I liked this wine. For the price it’s easily one of the best values I’ve had recently – $30 is a steal for the quality I felt like I was getting, and I’ve sipped more expensive wines that impressed me far less. If you’re looking for that last minute bottle before Christmas (I know…it’s tomorrow), or for something special to share besides bubbles on New Years Eve, you won’t be disappointed in this one.